There is way out of the climate change disaster. And there are many things we can do to have an impact. These actions are addressed in-depth in the New York Times best seller Drawdown. 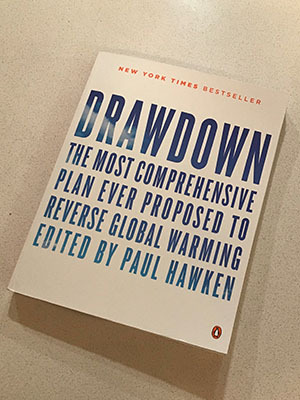 The editor and creator is Paul Hawken, and the Drawdown Project was developed by an international coalition of almost 200 researchers, professionals, and scientists from 22 countries. They came together to offer a set of realistic and bold solutions to climate change that are already successfully being done and need our support to scale up. The Havurah Climate Action Team invites you to join us for a series of book discussion sessions at Havurah, on March 28, April 25, and May 23, about this ground breaking book. Please prepare by reading the sections of Drawdown on Energy, Food, and Women and Girls. For more information contact Andy Beers at andy@andybeers.com or 425-985-0997. Everyone is invited!